A World War II-era incarceree who became an Army staff sergeant was honored as the Military Hero of the Game at Monday’s Los Angeles Dodgers-Arizona Diamondbacks game at Dodger Stadium. Jack Kunitomi, 100, of Los Angeles grew up in Little Tokyo and was confined in the Manzanar and Heart Mountain camps before being drafted into the U.S. Army in 1944. 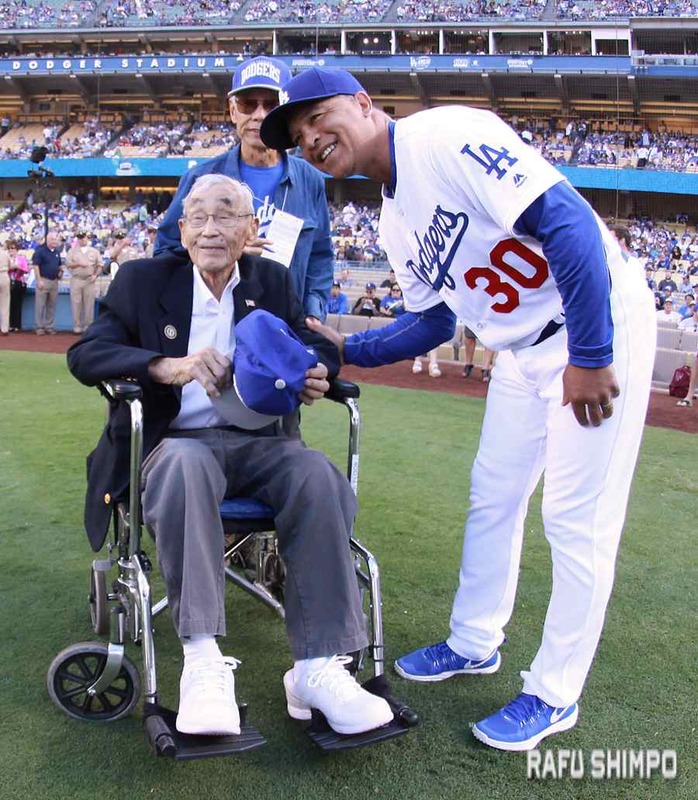 He and his new bride, Masa Fujioka Kunitomi, played on baseball teams in Manzanar. Their eldest son, Dale, was born in Heart Mountain. With his wife and son still behind barbed wire, he entered the intensive language training of the classified Military Intelligence Service. 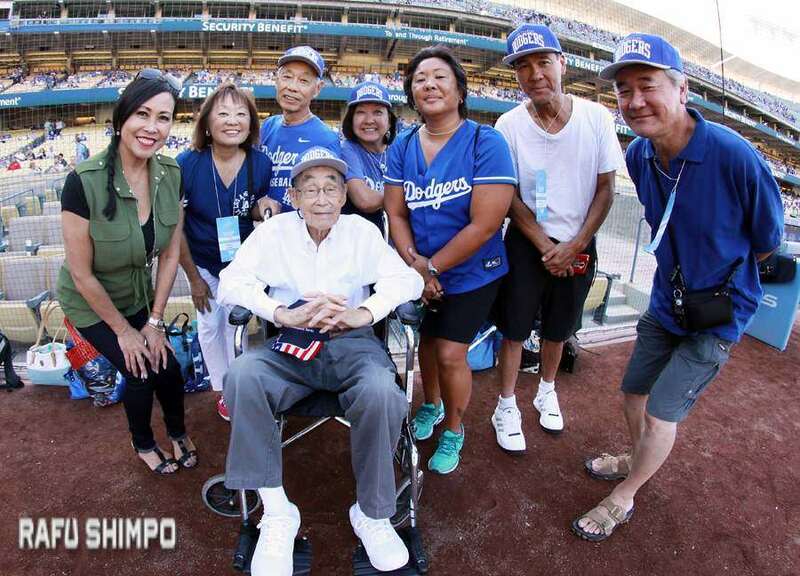 Kunitomi, a longtime Dodgers fan and father of five who will turn 101 next month, was joined on the field by his family. Son Dale helped him stand up from his wheelchair as his image was displayed on the screen and the announcer introduced him to the crowd, who gave him a standing ovation. “The Dodgers thank you for your service, sacrifice and dedication to our country,” the announcer said. Kunitomi served under Gen. Douglas MacArthur in the Philippines and Tokyo. In wartime, Kunitomi and other MIS soldiers translated captured Japanese documents and interrogated prisoners. After the war, they facilitated the U.S. occupation of Japan from 1945 to 1952 as translators and interpreters. After returning to the U.S., Kunitomi received bachelor’s and master’s degrees from USC and taught in the Los Angeles Unified School District for more than 35 years. He now resides at Sakura (formerly Keiro) Intermediate Care Facility. He and other Nisei veterans have been recognized at many events, including the Congressional Gold Medal ceremony in Washington, D.C. in 2011, which honored Japanese Americans who served in the MIS, 100th Infantry Battalion and 442nd Regimental Combat Team. Kunitomi and his family continue to be involved in preservation efforts at both Manzanar and Heart Mountain. His younger sister Sue Kunitomi Embrey (1923-2006) was the driving force of the Manzanar Committee, and for nearly four decades led the effort to recognize, preserve, and interpret Manzanar. Throughout the 2016 season, the Dodgers are thanking and paying tribute to the men and women of the Armed Forces by honoring a Military Hero of the Game. During the same game, former Dodgers first baseman Ron Fairly was recognized for his efforts in support of servicemen and women. Fairly is a finalist for the 2016 Bob Feller Act of Valor Award, named for the Hall of Fame pitcher who was the first Major League Baseball player to enlist in the armed forces after the attack on Pearl Harbor. Fairly is a board member of Rebuilding America’s Warriors, which makes it possible for servicemen and women who have been injured while on duty to receive reconstructive surgery at no cost to them. Singer Amy Renee Heidemann-Noonan from the pop group Karmin performed the national anthem prior to the start of the game. 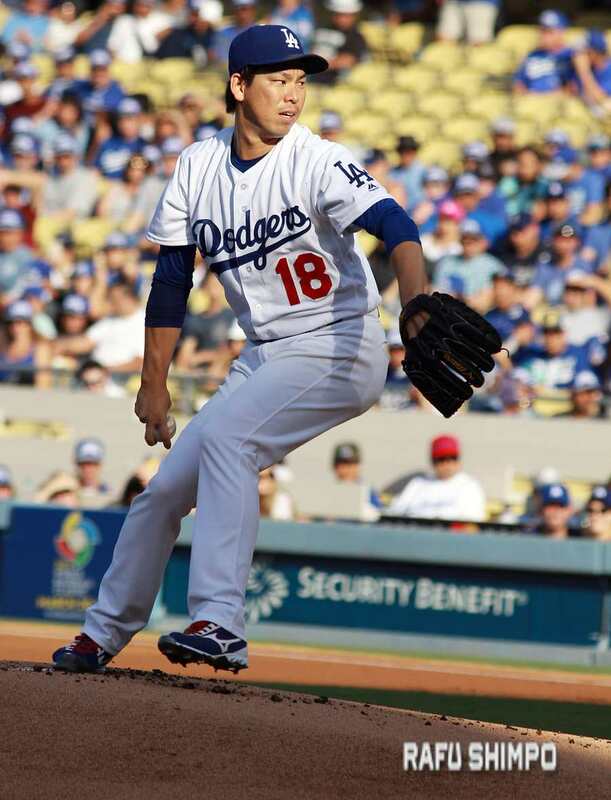 Kenta Maeda pitched 6-1/3 strong innings en route to his 14th win of the season as the Dodgers outslugged the Diamondbacks in a 10-2 victory.